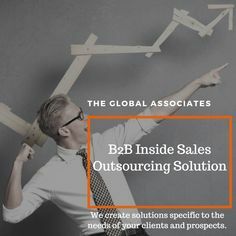 Mastering the art of conversation is essential for the sales reps of top companies providing Lead Generation Services like The Global Associates since every business relationship starts with a meaningful dialogue between a sales person and an interested buyer. This process is all about interacting with people, to undermine the significance of energetic, productive conversations is just not possible for the providers of lead generation services. Your sales persons should be smart enough to make the customer feel comfortable with their words, with their attitude. Prospects will naturally have doubts and concerns about your capability and your intentions to begin with, and it will change only when you provide them clarity and change their perspective. You should strive for a better mutual understanding between you and the customer, which would allow both to focus on possible solutions with vigor and energy. Lead generation services providers should gradually try to build rapport with the prospect and spend more quality time in ascertaining their needs and main issues. Having good conversation skills is thus necessary to be able to create such special moments that convince the client that what you are selling does make sense for them. Following are some golden tips to help you achieve this objective. Never act or behave like a greedy salesperson, change your attitude and act like a problem solver. You must demonstrate in clear terms that you possess the capability to help them solve their problems and have their best interest at heart.Have a set of open ended questions to elicit the right information in order to know them inside-out and clearly understand their requirements and main issues. Working with a good script is essential,but sticking blindly to it is never a good idea. Always be flexible and go with the flow, it’s all about what the customer needs after all. Going slow is generally a good policy for the providers of lead generation services.Your first step should always be to try and build credibility with the customer. Demonstrate your capability and good intent to establish yourself as a trusted industry peer, the sales process will move forward once you have their confidence. You can begin by providing useful industry information and offering to research their main issues even before they show interest.